Continuity mistake: When the female owner of Beethoven's girlfriend (Virginia or something like that) tells her boyfriend (Floyd) to put the leash on the dog, he goes to do so but when you see his hand clip the leash on, the shot changes to a woman's hand clipping the leash on (the nails are covered in nail polish). Continuity mistake: At the carnival, when the boy is standing in line for tickets, the girl he likes has her hair hanging straight. In the next shot, it's tied back in a ponytail. Continuity mistake: At the beginning of the film when they all get into the 2 cars. Beethoven looks out of the window, the camera cuts to a back view of the dog then to the front again. Now he has a tennis ball in his mouth that wasn't there before. Revealing mistake: When Ryce is talking to the vet on the phone, the vet would have to be talking extremely fast because of how little time there is between Ryce's questions. Continuity mistake: In the opening of the movie, the little girl asks if they are late. When the family gets into the cars, she's not there. 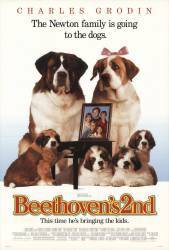 Continuity mistake: Near the start, Beethoven goes into Ryce's room and begs for her to play ball. She is holding a violet top, but when she turns around to face Beethoven, it is black. Other mistake: The puppies constantly change age/size between scenes. Notably near the beginning, in the basement they are old enough to be walking around when the janitor is whistling to them, and a few minutes later in the Newton's basement they are nearly newborn. When the family go on holiday, when Ted is showing the puppies to the girl with braces, they have grown quite big to nearly adult size, and in the next scene where Mr. Newton is chopping firewood and they are cooped up, they are pretty young again. Regina: If you want your dog back, call my lawyer.